With nearly 80% of South Africans first seeking help from Amagqirha (isiXhosa for traditional diviner-healers) before seeing Western medicine practitioners, collaboration across the healing divide holds huge promise for stemming the AIDS tide. 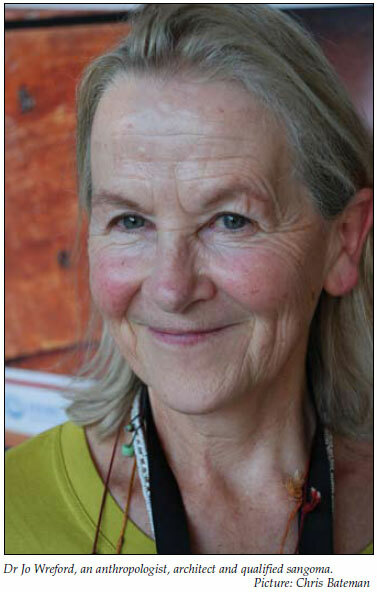 Dr Jo Wreford, an anthropologist, architect and qualified sangoma, told delegates at the 5th Social Aspects of HIV/AIDS Research Alliance (SAHARA) conference at Gallagher Estate on 2 December last year that accredited traditional healers who were qualified in HIV counselling were already making a difference. The petite University of Cape Town lecturer has been working with 2nd- and 4th-year medical students in the hope of helping them bridge the cultural divide to create more effective outcomes, especially around HIV/AIDS. She cited the HOPE Cape Town Isangoma Pilot Project, based at Tygerberg Hospital, in which community health workers worked alongside Amagqirha over 6 weeks, giving the latter a solid biomedical understanding of HIV/AIDS, and HIV counselling training, before returning to work in 3 local township communities. The aim was to encourage crossreferrals, incorporate voluntary counselling, promote testing and reinforce HAART adherence via the traditional healers' practices. So far just 3 of the traditional healers had referred a total of 255 clients, half of them men, to local clinics and hospitals for HIV testing and treatment, providing a small but powerful illustration of what was possible on a wider scale. Wreford said the scales were strongly tipped in favour of Western medicine in South Africa, with the differing bodies of knowledge and understanding highly contested and traditional healing viewed in a negative light by most doctors. The amount of blaming that went on around some traditional medicine practices had given the Amagqirha a very poor reputation, whereas an approach seeking mutual respect and understanding could reap potent health care benefits. The traditional healers she had worked with had shown great creativity in adapting a consulting session or Ukhuvumisa (to allow or channel), known for its more dogmatic directive approach, into effective HIV/AIDS counselling. She cited the case of an anxious woman who had recently tested HIV positive and approached a healer for advice on getting her boyfriend, still ignorant of her status, to go for a test. The igQirha persuaded the woman to bring her boyfriend for a session at which she explained that 'sometimes diseases were hidden' and that by testing his blood he could begin to know what was going on in his body. She suggested that after the test they return to her to ask the ancestors what they wanted them to do about it. Wreford said this traditional healer had exhibited an uncanny ability to use the 'technology of hiding and finding' in an Ukhuvumisa session so that, once science had revealed what was hidden, the ancestors could help. Wreford told her highly attentive audience that both systems could work together in an inclusive and pragmatic approach. The couple she cited had promised the traditional healer that they would return for further counselling because she had given them the 'spirit and courage' to have an HIV test. 'We know that clients will go to a clinic for tests via the diviners' advice and that they will return to the diviners who have, as they so movingly say, given them spirit. The loss of spirit is to make oneself vulnerable to illness and death,' she explained. Therefore, from both the healer and the clients' perspective, divination had the power to reconnect the couple to the 'agency of their predecessors'. She was brought in by UCT to provide a different perspective and saw her role as helping students to understand as much as they could about 'what else is going on' when a client came to see them. She explained that the majority of South Africans consulted traditional healers because they were seeking deeper answers as to why they were sick. In the Western Cape many HIV-positive patients with CD4 cell counts well below 200 presented to a clinic or hospital and are offered ARVs. The doctor or nurse would then explain about ARVs, nutrition and adherence and send them away with follow-up visits scheduled. 'What concerns me is what then may be going on in the patient's mind. For example, if a small infection returns they might think they didn't consult sufficiently with their ancestors and return to an Igqirha to find out what's really happening. Now if that traditional healer understands the science of HIV medicine they won't undermine the HIV regimen,' she added. Wreford said her primary purpose was to create collaboration between the two paradigms to obtain 'mutually respectful dialogue'.